Want to play the game that's sweeping the nation? Already have a Bunko night organized? Get your dice ready and head over to Slots of vegas for all the Bunko Bonanza action you can handle. Bunko Bonanza is a 5 reel game. It features 20 lines and has bet amounts as low as one cent and as high as one hundred dollars. The wild card in this Bunko themed game is the Bell symbol and the scatter is of course the Bunko Dice. Are you ready to join our Bunko Bonanza party? Step up and place your bet amount plus the number of lines that you'd like to be on. The handy Autoplay feature is available for those who'd like to play automatically. Win a Fortune with Bunko Bonanza. Play Now! Get your drinks and pastries ready as the most awaited party of the year is about to get started! Bunko Bonanza is one of the most entertaining five reel slot machines available at Slots of vegas. 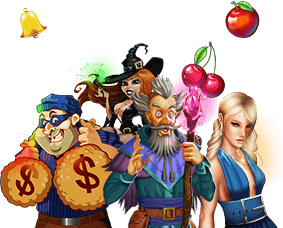 Bunko Bonanza is going to make you enjoy the best party ever as it comes filled with the most amazing payouts, free game rounds and a massive Progressive Jackpot. Bunko Bonanza slot machine is played at a maximum 20 lines and a max bet per line of $5. You may spin the reels by simply pressing the Spin button or you can have the game spin the reels for you by using the Autoplay feature. The Bell serves as a wild icon, substituting for any other symbol in a winning combination except scattered "Bunko Dice". Every time the Bell occurs in a winning combination prizes are doubled. Three or more scattered "Bunko Dice " appearing anywhere will trigger the Free Game Feature. The Free Game Feature will award 21 free games with game multipliers of up to 6x. Bunko Bonanza's Progressive Jackpot is triggered totally at random, regardless of the amount wagered. Substitute: the substitute icon serves as a wild symbol substituting for any other symbol in a winning combination. Scatter: three or more scattered symbols appearing anywhere will trigger the Bonus Feature. Progressive Jackpot: the Progressive Jackpot is triggered at random, regardless of the amount wagered.